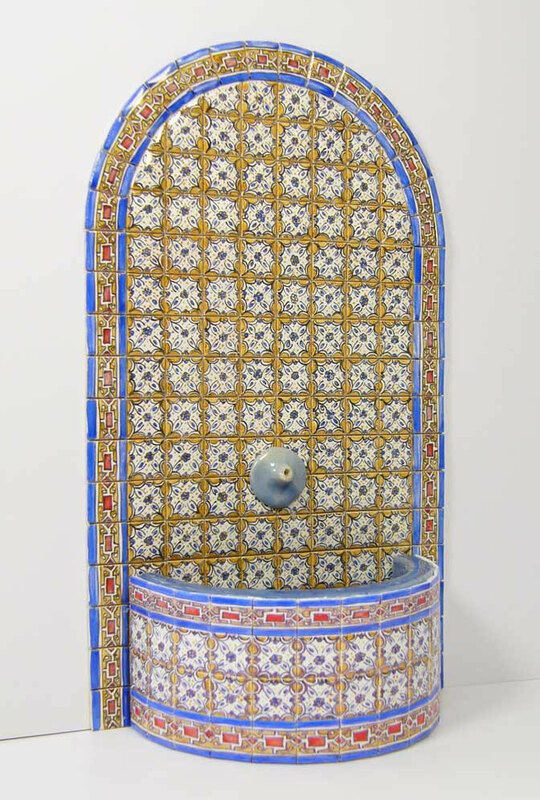 Nancy contactes us with the wish to get a Maroccan Fountain. First we did some reseach on the topic, then we made sketches of different versions. Nancy decided to have us made this sophisticated miniature fountain. 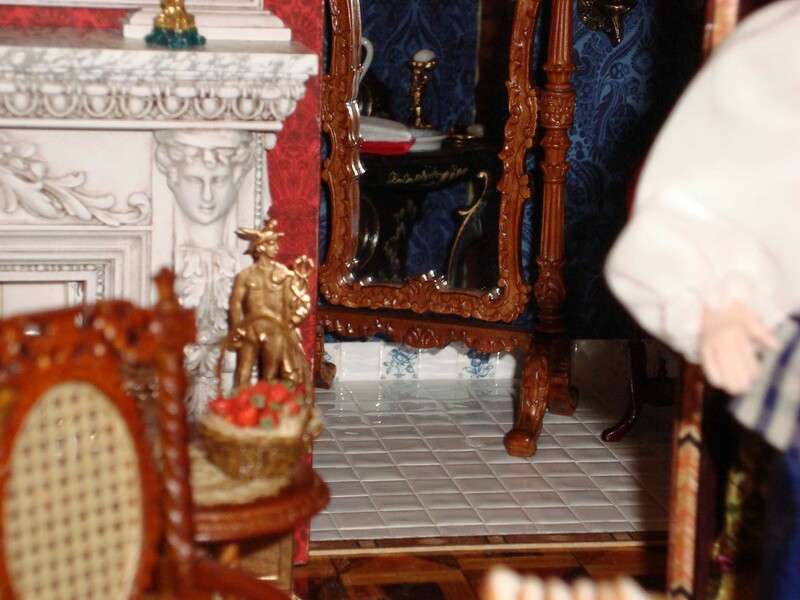 It shows a round top and a half round basin with a spout. 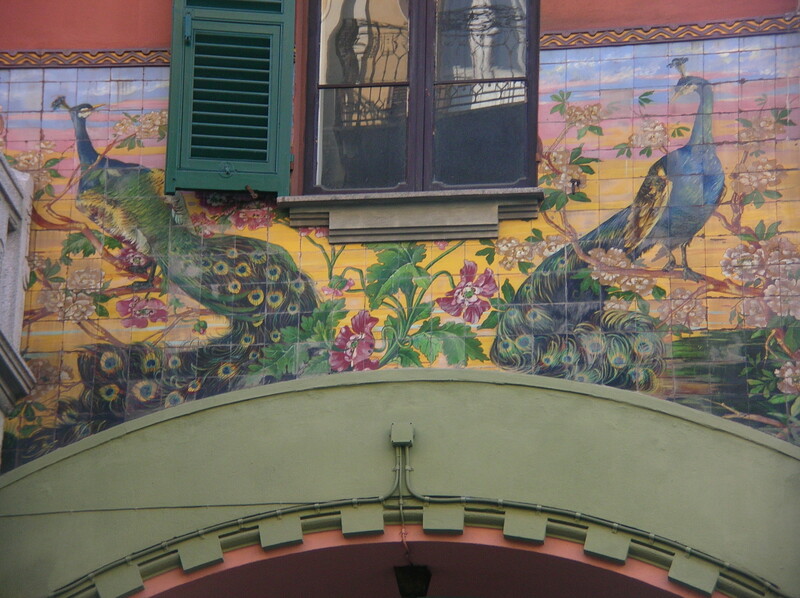 All tiles are hand painted with the typical ornament tiles of the region. We thank you Nancy for the order. 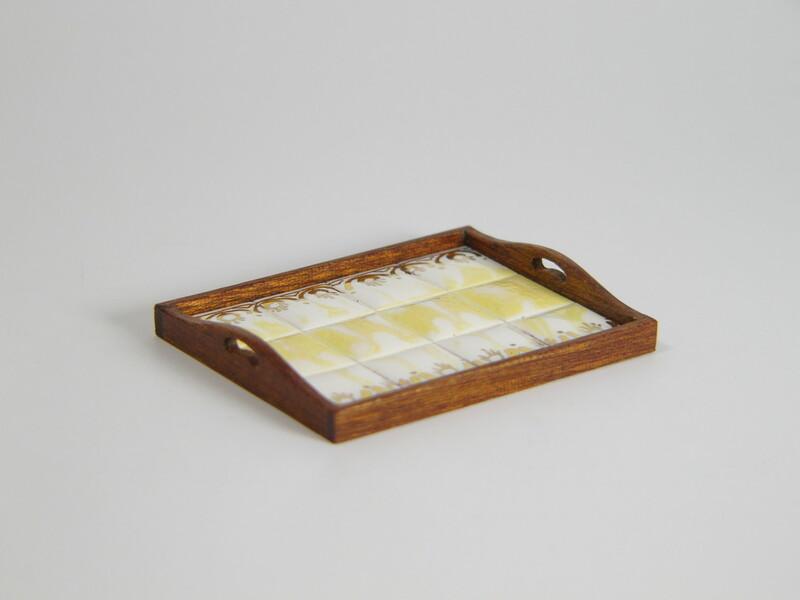 It was a pleasure to make this miniature project for you! 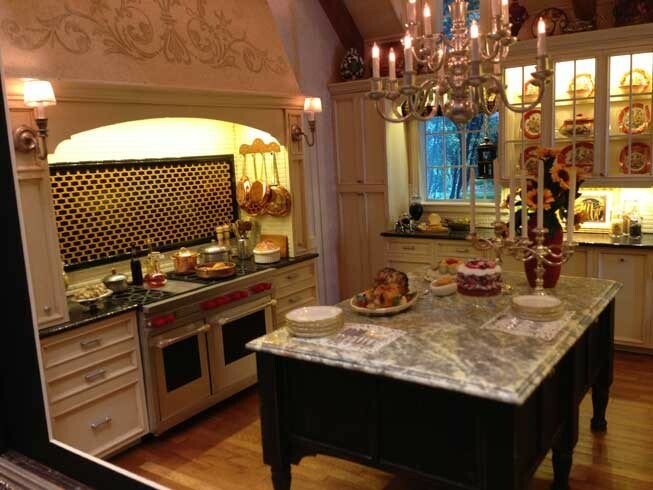 Thank you Georgia for sharing the photos of these romantic rooms with us! 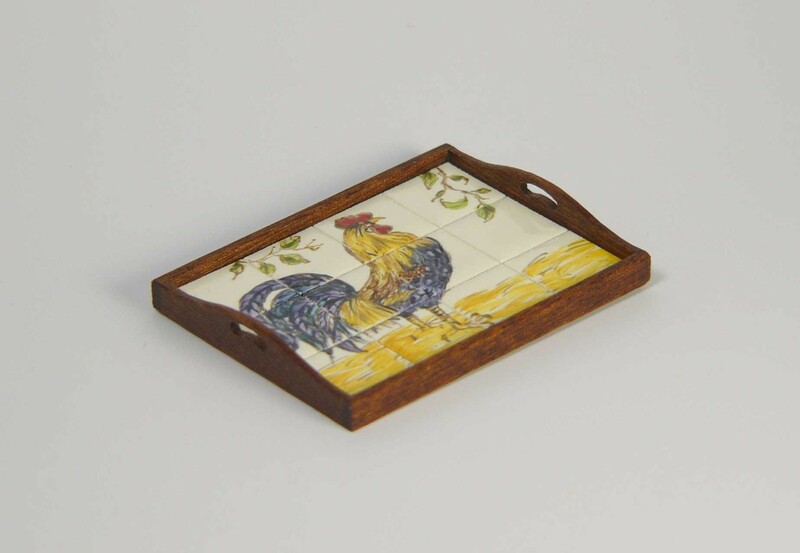 Wall murals and trays with chicken and rooster enhance the country styl look of a kitchen. For the Good Sam Show in San José, California, we made some special items depicting our feathered friends. 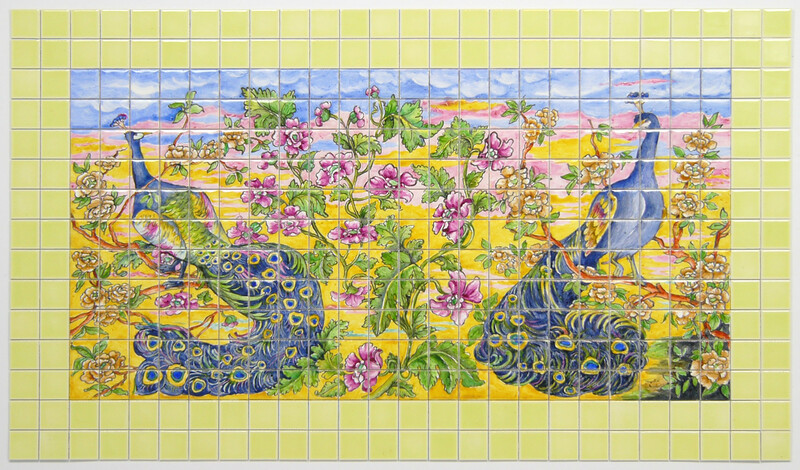 Come and see the original niniature murals and trays on October 11th and 12th! We will be happy to welcome you! 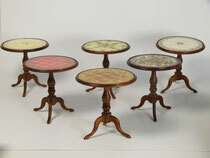 Tiled coffe or tea tables can be placed in nearly every room in the house. 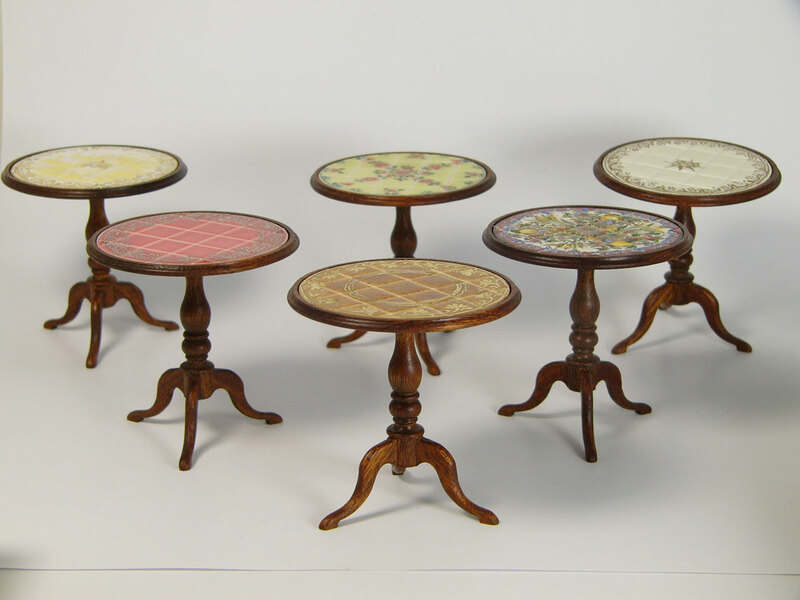 Some tables are timeless and elegant and others fit well to a country style house. 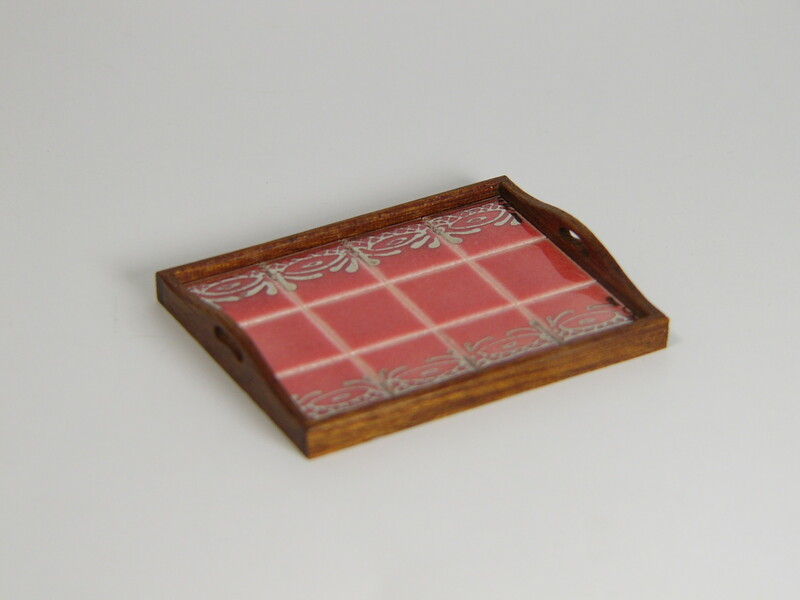 For some of them we made accomplishing trays showing the same design as the table. 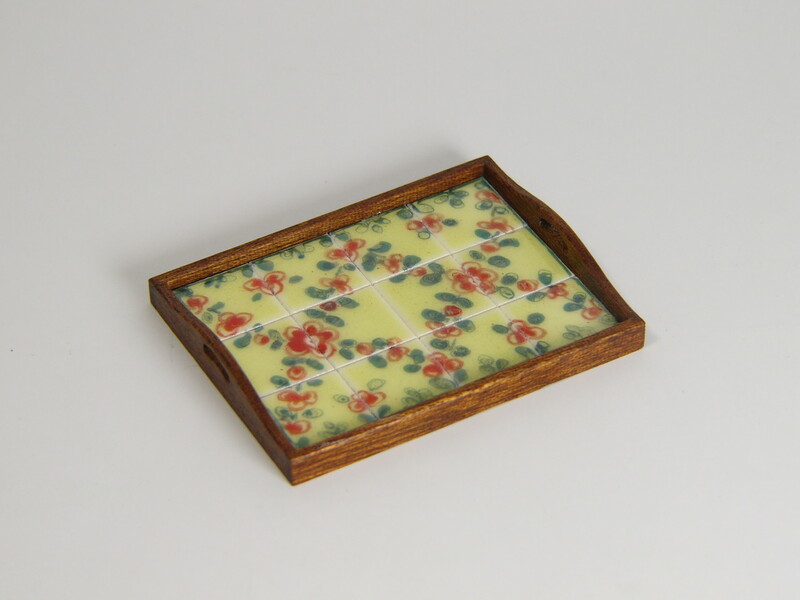 For more tables and trays and detailed photos please visit the site tables/trays site. 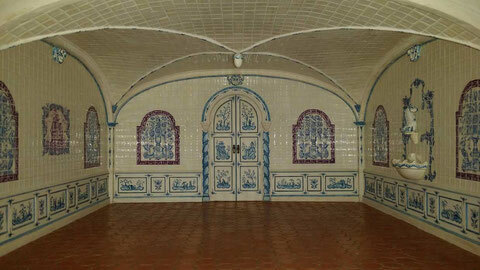 Gabriela from Vienna made this miniature-room refering to castle cellars build all over Europe betrween 1650 and 1780. The rooms show of the following architectural elements: a floor of hexagonal tiles made out of red clay, walls coverd with a wooden board embroidered with asian inspired elements as well as tiled walls and a tiled arched ceiling. 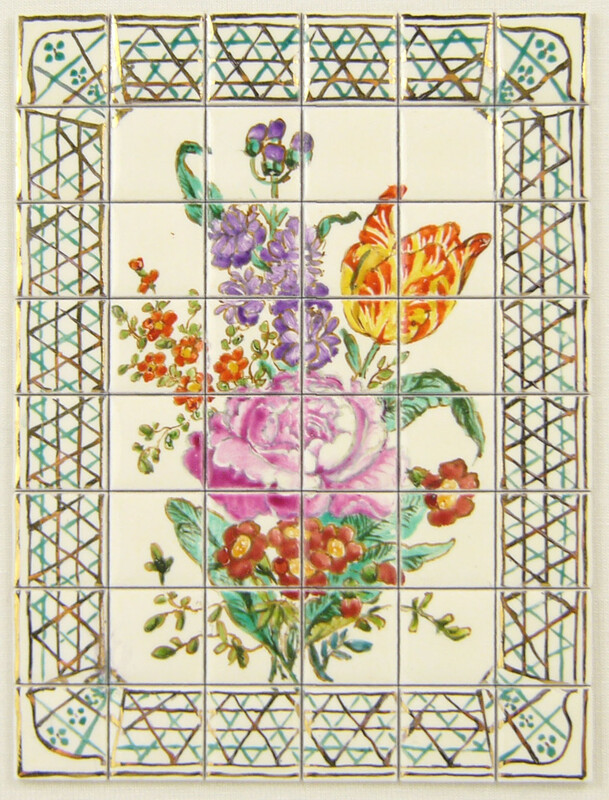 Hand painted pictures of sailing ships and harbour scenes as well of variations of flower bouquets were favourable designs on tiles at that time. 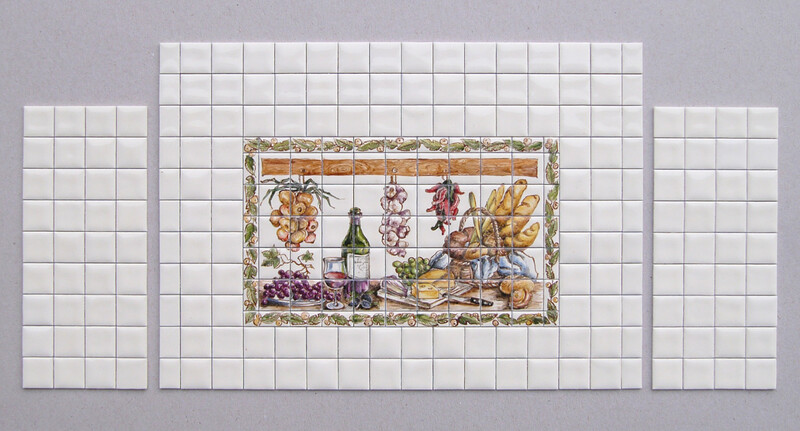 The tiles gave the cellar a clean, cool and fresh mood and made it a good place to have dinner at hot summer days! 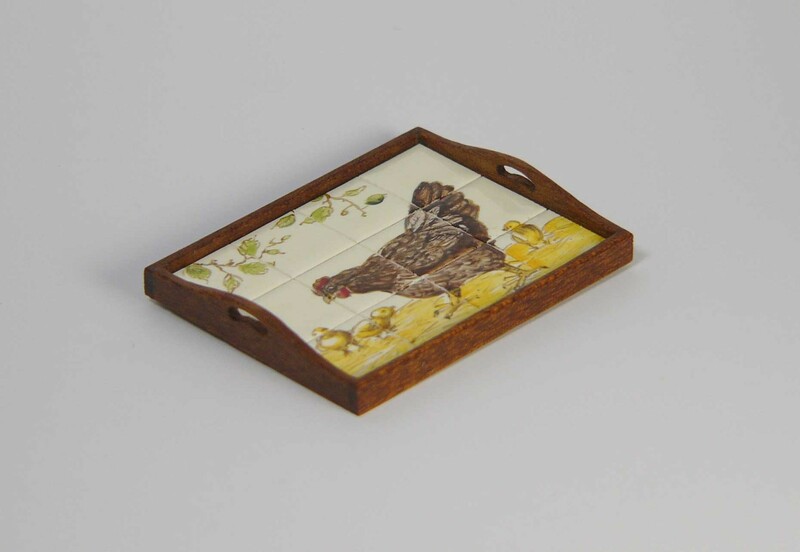 We are very happy that we could take part in this project with our miniature tiles. 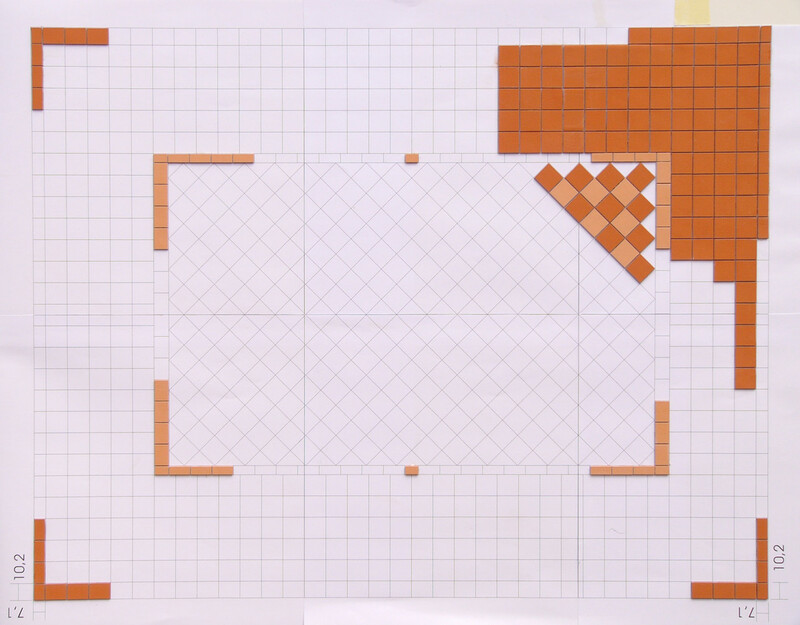 Gabriela not only cuts a lot of tiles to shape for the arched walls, she mounted them all and found appropiate, good looking solutions for the edges were the walls and the ceiling come together. 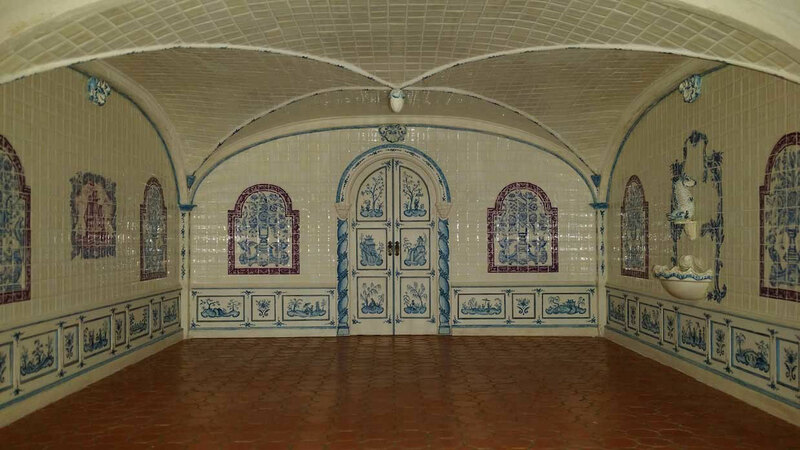 The cellar looks as if the photo was taken out of our tile books! So real! 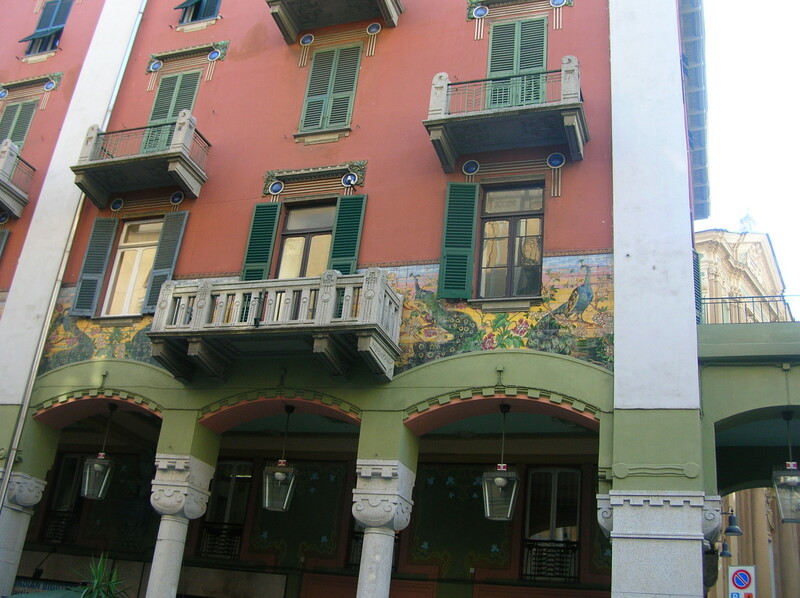 The right place to feel good after a long day is a terrace surrounded by nice flowers and cool water. Some people relax by having a sunbath others prefere to read the news of the day as you can see here. Jörg Simon and friends created this summer time scene. Karin Caspar made this unusual roombox in adobe style and Jeannette Buchholz did all the wonderful flowers. Miss Sally's World und Cornelia Köhler are responsible for the dolls. 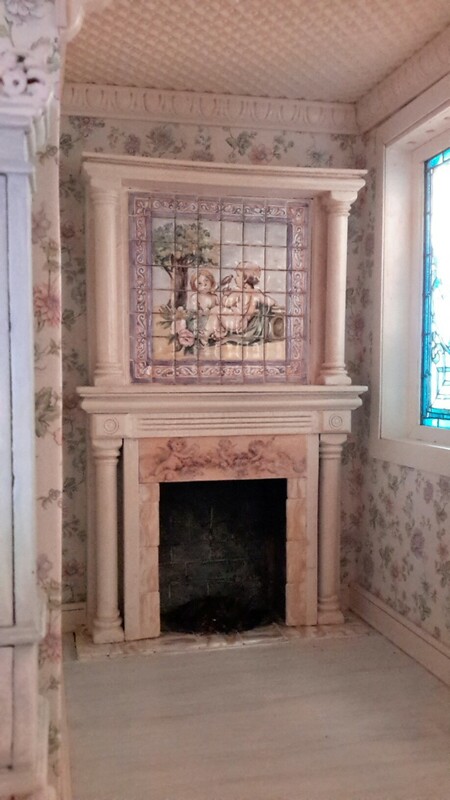 The centre of the arrangement is the hand painted miniatur tile mural 'Maritime et Campestre' with hand carvings at the top. 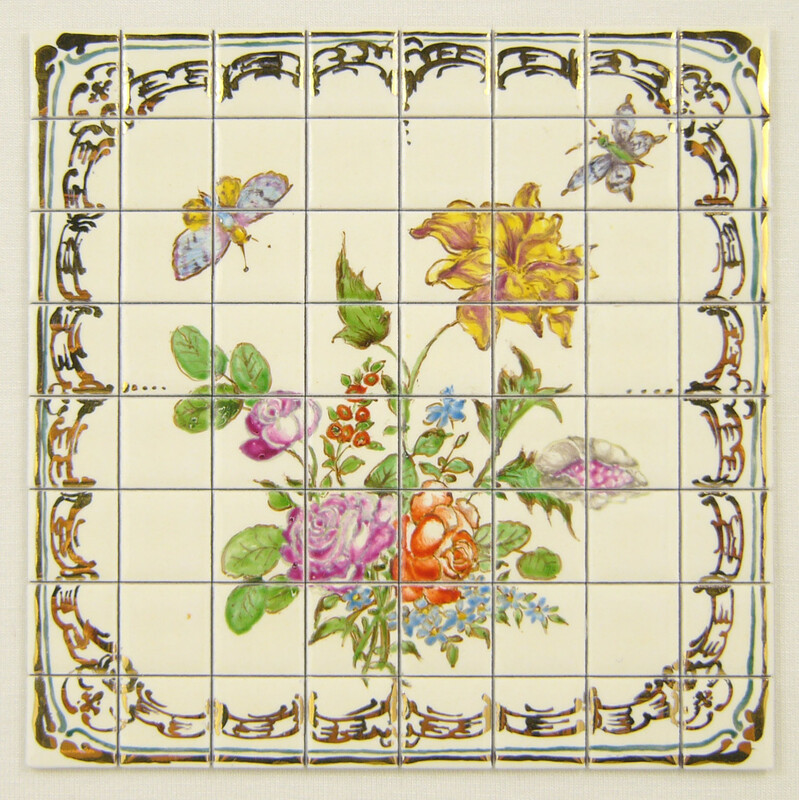 The original was made between 1750 – 1800 in Portugal, a famous tile making country. 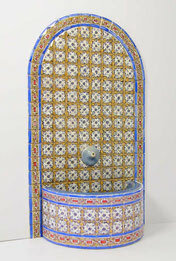 It now hangs in the tile museum of Lisboa still in a good condition. 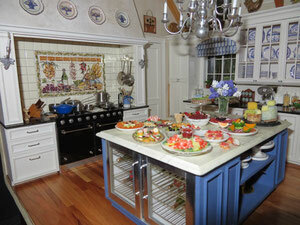 Sophia Twaddell made this impressing kitchen during a workshop. 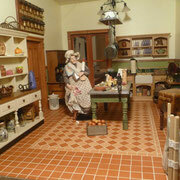 For the area above the stove we made real miniature tiles for her according to her wishes. 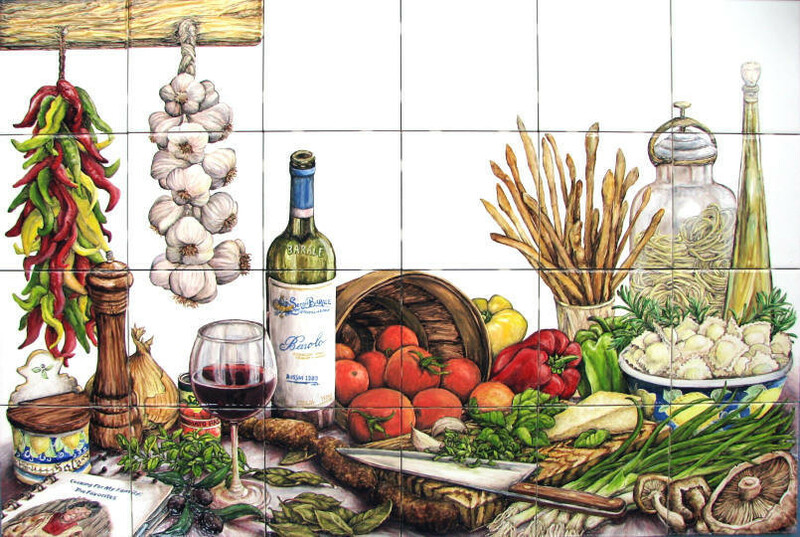 As you can see Sophias mural complements the fresh and tastful arrangement. 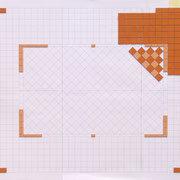 First of all Sophia sent us a photo of the area where she liked to place the tiles together with a picture of what she had in mind. Then we talked a bit back and forth about how to adapt the picture best and what border will fit. 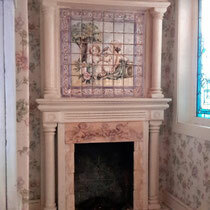 After having agreed about the details we made the desired glossy cremy tiles and hand painted the image and border. 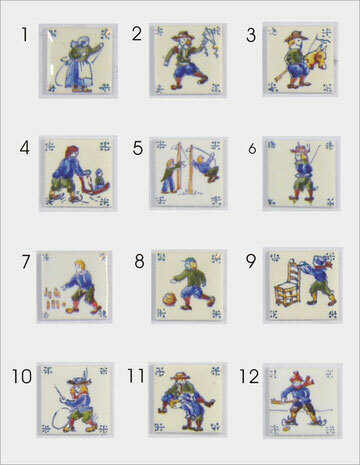 As more and more people ask for tiles showing children games we extended the range of designs to 12 now. 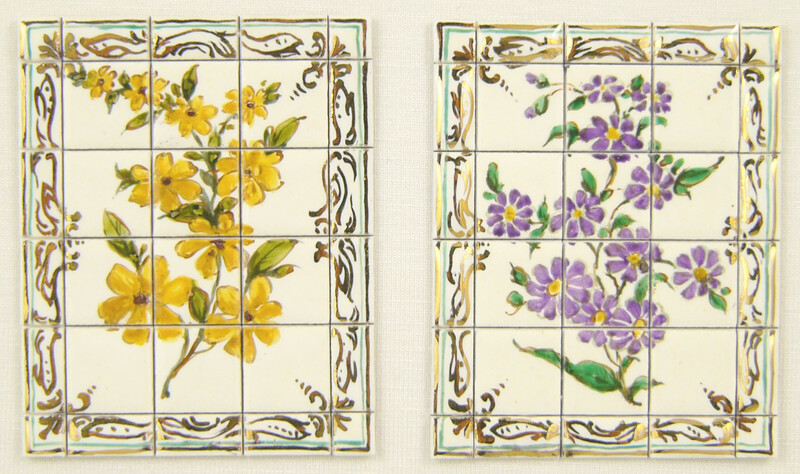 They all are lovely and look very nice in combination with blue or green tiles. 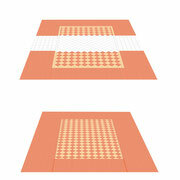 The combinations are mostly applied behind the stove and as as a backsplash. 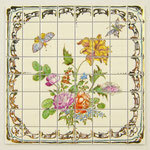 For sizes and prices please have a look a the page 'single tiles'. 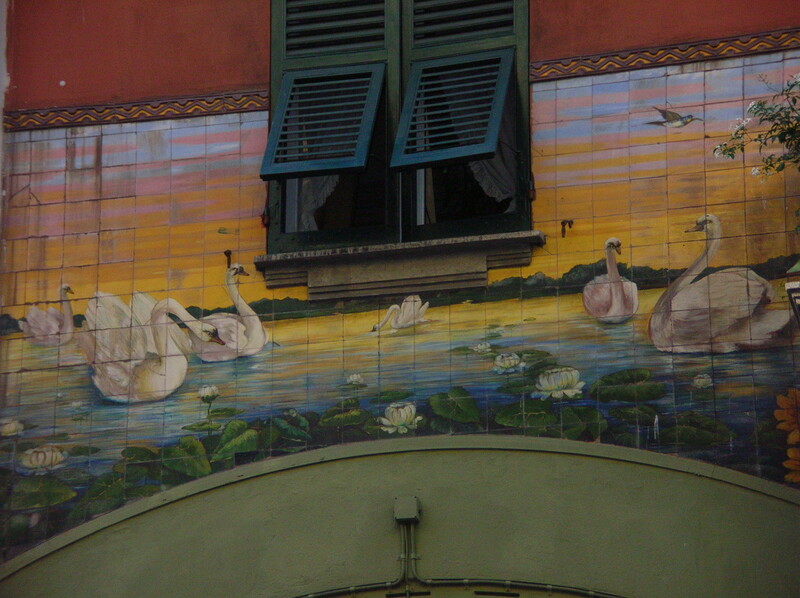 Our Swiss friend Angie who makes Miniature Babies (and will exhibit on the Chicago Miniature Show this year the first time) one day send us some photos from a house which was embroidered with Art Nouveau tiles around the facade. We love the colours and the mood which is calm, positive and strong at the same time. Here is our version as miniature wall mural. In Germany this year we have had a very mild winter. The first cranes announcing the upcoming spring have been passing our house on their way from southern to northern Europe. 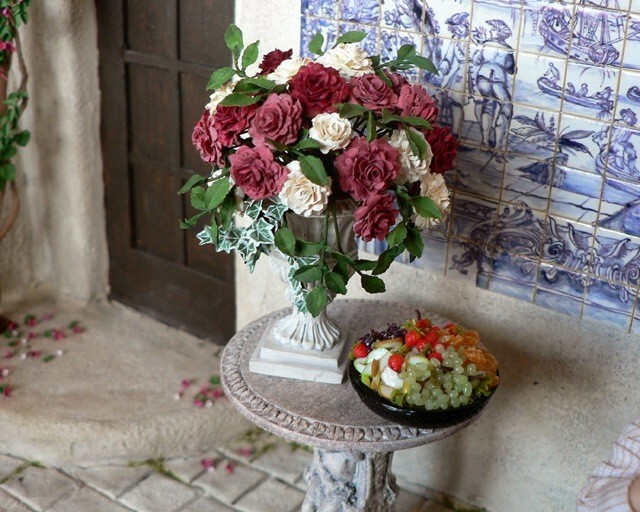 This inspires us to issue a serie of flowers as you can see. All of them are made of porcelain and hand painted. As background a off white glossy glaze was chosen. 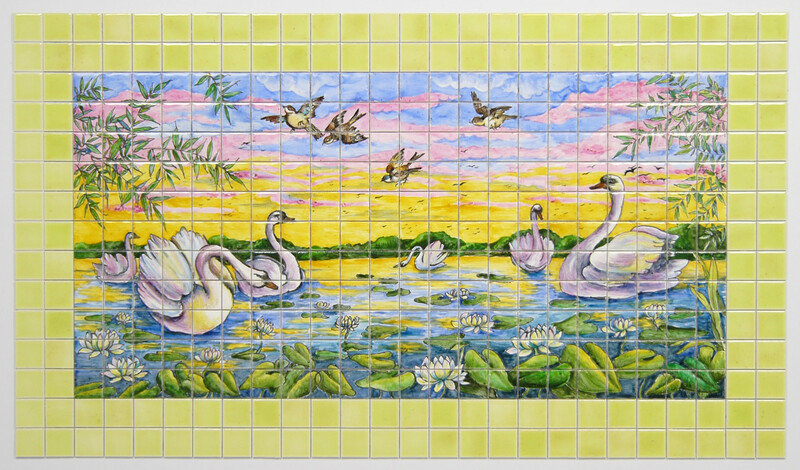 For the size of each tiles mural, please click to enlage. 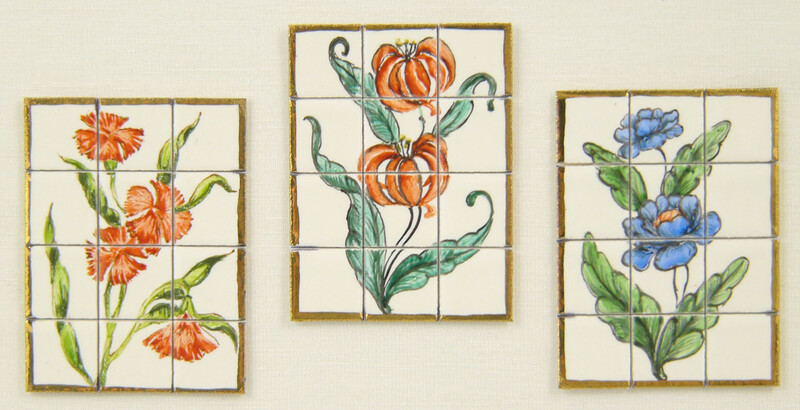 These and further miniature tile muralswill be presented at the Chicago International Show in Chicago in April. It would be a pleasure for us to welcome you there! 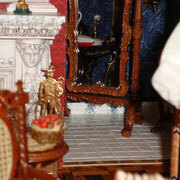 This dollhouse room box is inspired by the dollhouses in the Rijksmuseum in Amsterdam. 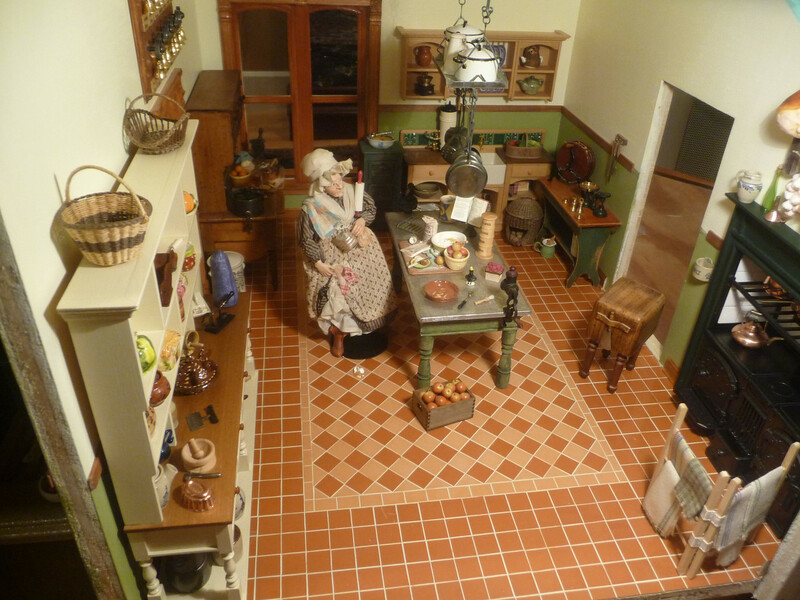 Here are the famous dollhouses of Petronella Oortman and Petronella Dunois. 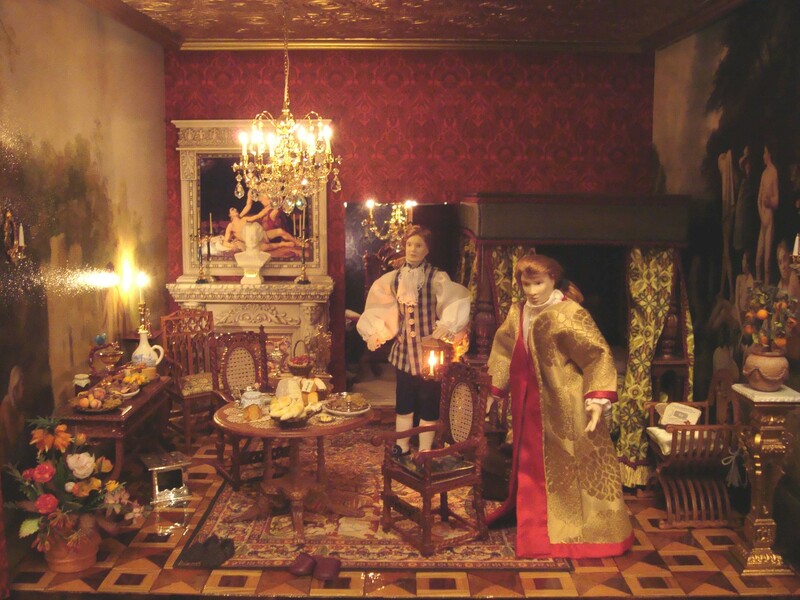 These dollhouses are made in the 17th century by the wives of wealthy merchants in Dutch patriciërs. 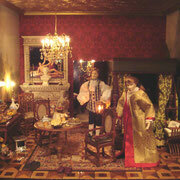 My dollhouse chamber is lined with burr-walnut verneer and has the look of an old Dutch dollhouse. The materials come from all over the World. 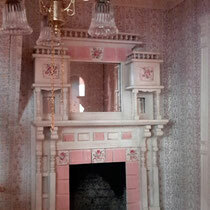 The two side walls are inspired by old Dutch paintings from the 17th century and are copied in oil in China. 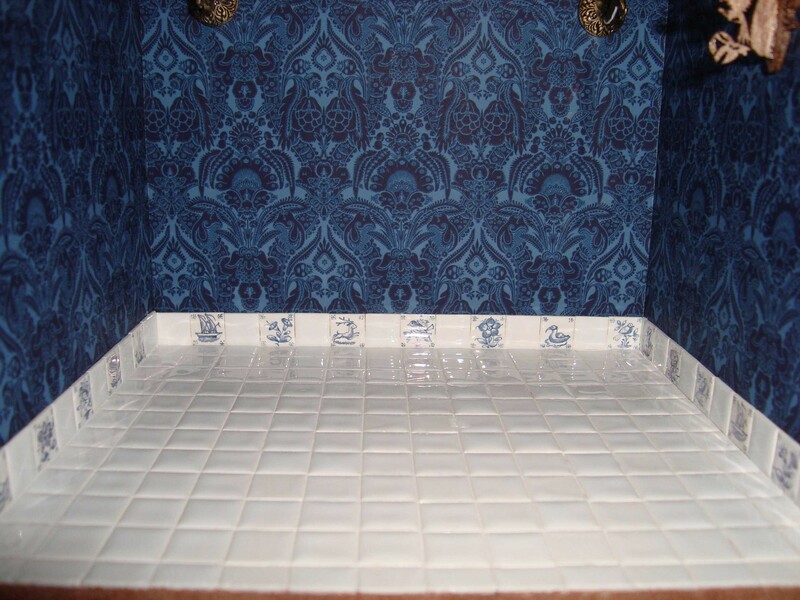 The laundry room is lined with Delft tiles in white and white/blue in Dutch tradition. The scene sets a breakfast in an ancient palace. The survant comes in secret to ask the Stadhouder-King if the guest has already arrived. Who is these guest and why does the survant secretly comes with a red latern? 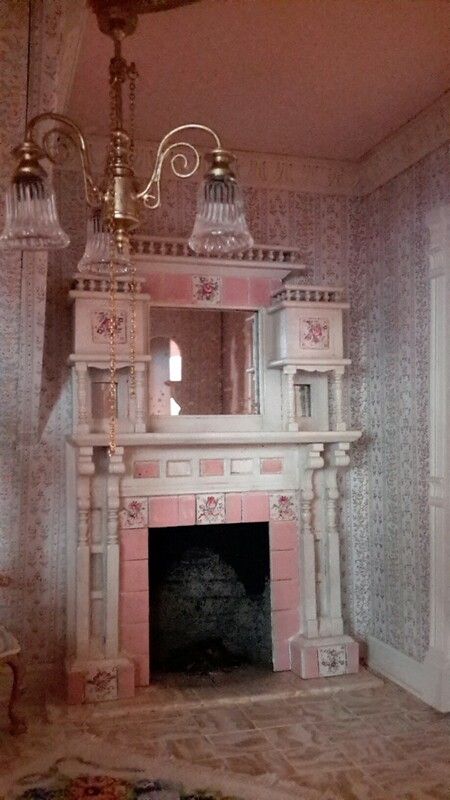 These scene could have played at the time of Stadhouder-King William III at the Royal Palace het Loo in Apeldoorn. 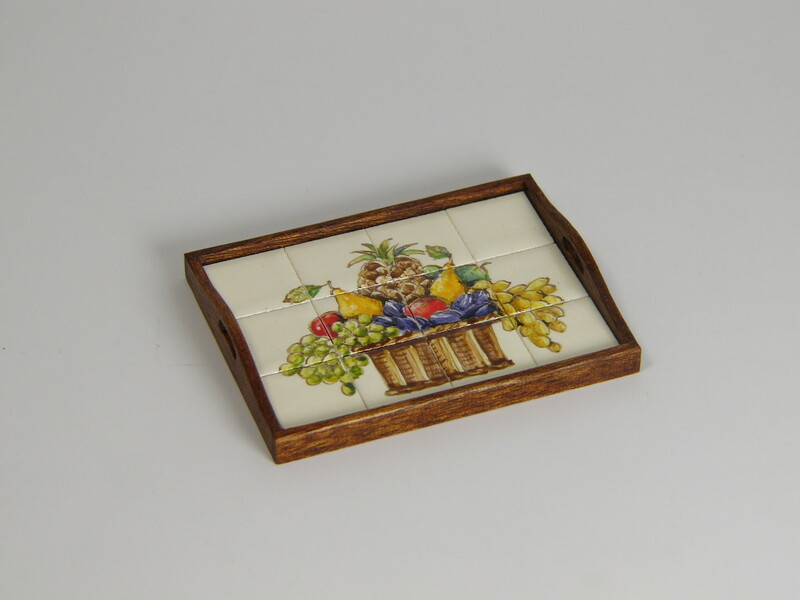 It is very nice to have made this intensive project that, thanks to, Tiny Ceramics Miniature Tiles has its authentic look. 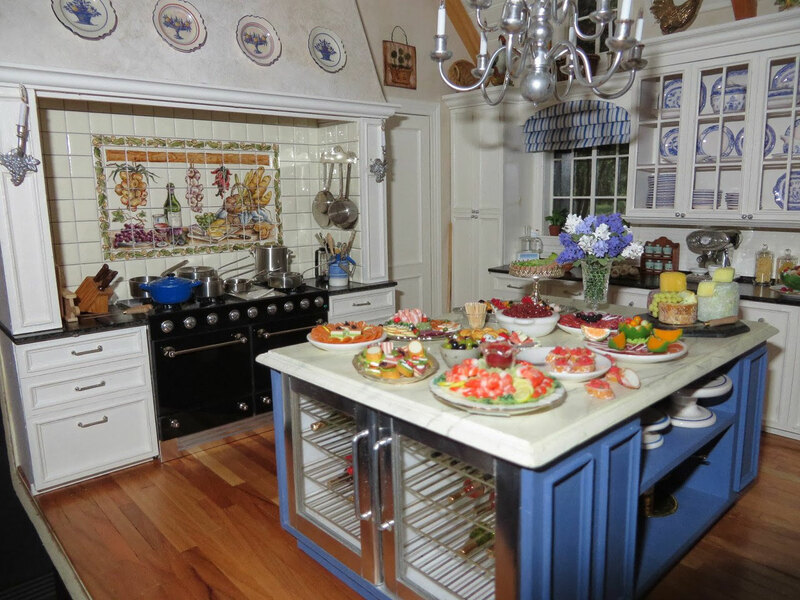 New Years Eve partys usually start and end in the kitchen! Here you can see Marianne making an apple pie for this occasion. She now dares putting the wooden apple box directly on the floor. Even after one of the eggs have fallen down she keeps quiete. She is happy as thanks to Diane, the owner of the house, she is having a new terra-cotta floor in her kitchen which is robust and gives a warm athmosphere at the same time! Diane has told us her wishes concerning the look, pattern distribution and color preferences last year (News June 2013). 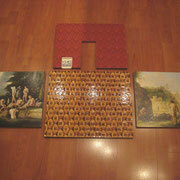 In the meantime we made all red and salmon tiles out of real natural clay and cut the special tiles to size. 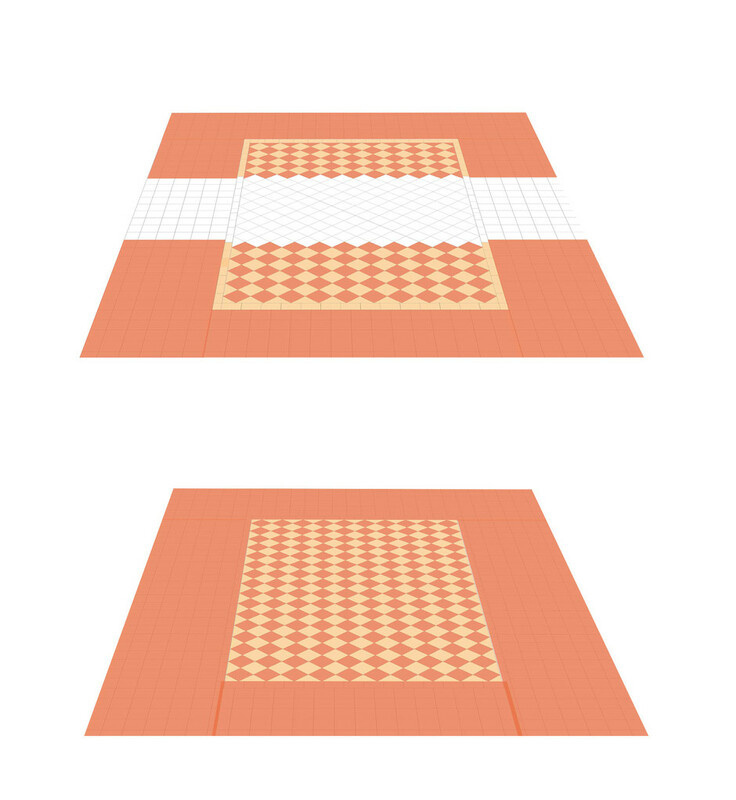 Diane glued all tiles accurately on the floor plan. 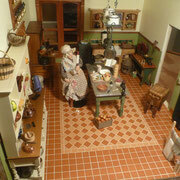 As she decided to make the floor look real, she sandpapered the surface smoothly, put bee wax on and polished it. That sealed the surface and gave it a reserved glace! 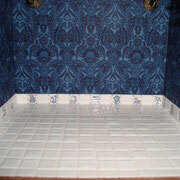 The final step was grouting, enhancing the lattice structure. 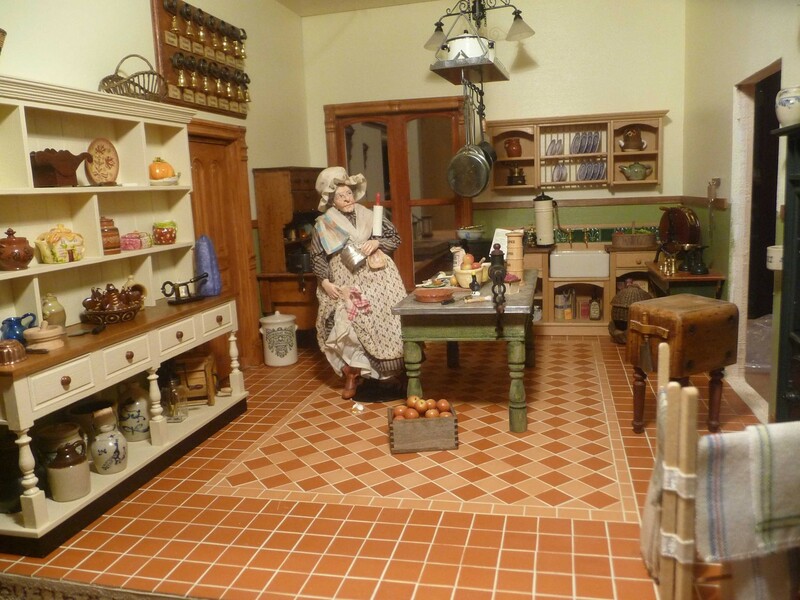 It is a pleasure to see how well the floor supports the the look of the well equipped country style kitchen of former times.We had a joyful time during the project with you Diane! Thanks for that very much!